Wen her gets up 2 yooze teh lidderboks Ai wul taek ful pusseshun! Waz you watchin tehm? That be preddy much what happined! Conga bedtheefs onna lonely solo, anni! Ai noe kittehz! Thx fur teh congrats, Prysma! that is a good idea for the kitties! Hmmmmm that mite work very well at the shelter cause easy peasy to clean. Pillowcase fits pretty tightly wif box inside, so is tenshuns, tehn I use cupple-free metal binder clips to hold it shut onna open end. 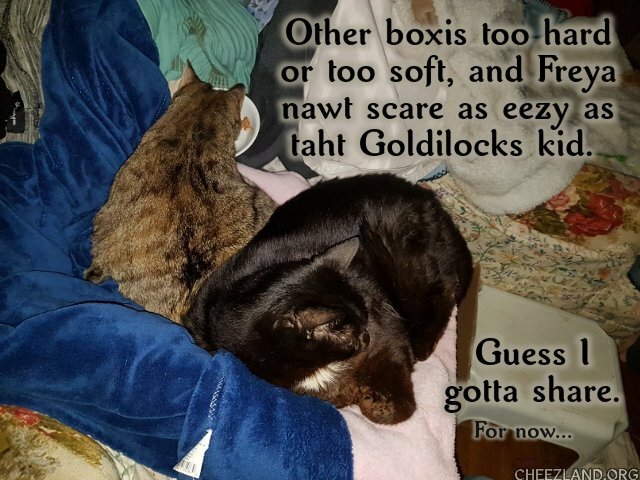 If you wants I can take a cupple pics uv it wifout teh egstra blankies on tawp. And iz berry berry eezy tu cleen. Pillowcases am cheep at thrift stores and wash eezy. Box useta has paperbacks innit, but it got repurposed. thay DEW luk pretty larje dere, luvlee ohaikew Jack!